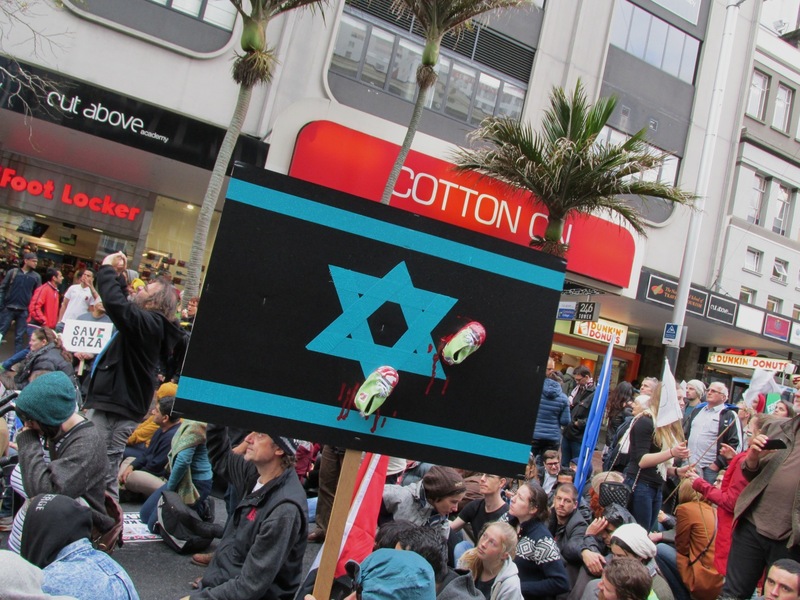 Gaza Massacre draws thousands to protest in Auckland, New Zealand. 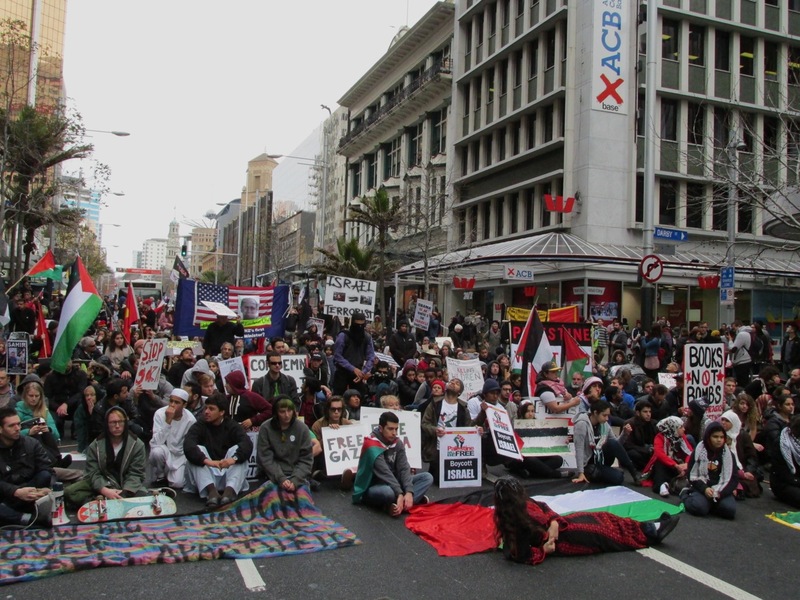 Spirited DissentBetween 3000-5000 humans blocked Auckland’s Queen St on Saturday July 26 to protest the Zionist Israeli government’s bombing of Gaza.Organizers called for an end to Israel’s siege on Gaza, apartheid on Palestinians, and for the United Nations to do its job properly with urgent intervention.The protest chants included, “Free, free Palestine. Free, free Gaza. Israel, Israel, how many children have you killed today? 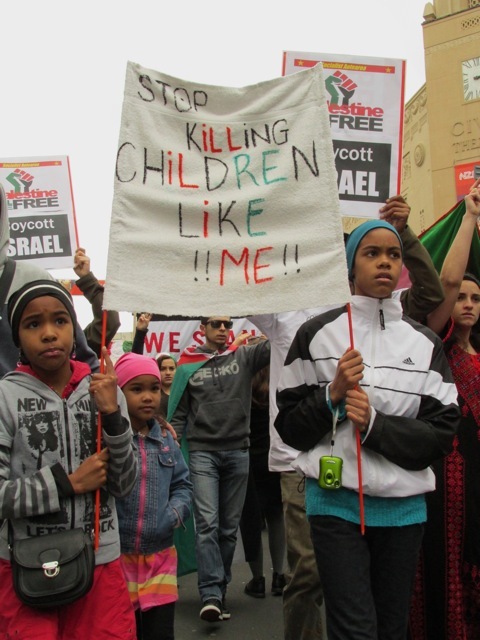 Israel, USA, how many children have you killed today?”Bystanders watched demonstrators lie-in at an intersection. A minute’s silence for victims of the massacre was delayed until a hovering police helicopter buzzed off. The marchers made their way down the CBD’s main street to gather outside the US Embassy, housed in the CitiBank building on Customs Street. There they sang, “In our thousands and in our millions, we are all Palestinians.”A citizen media contingent captured the event, as did bystanders. Such coverage is crucial to getting the word out in a world where the mainstream media sit on the fence so much, their trouser’s, skirts and dresses have rusty wire marks. They are more interested in giving pre-match coverage for sports than pre-march publicity. 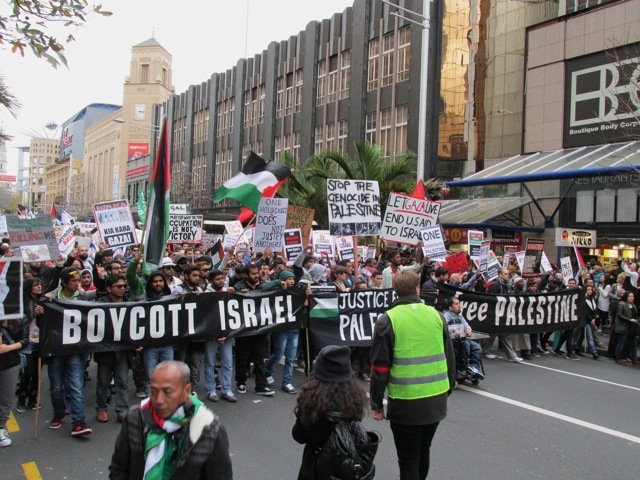 Organizers say the protests will continue every Saturday until the siege on Gaza stops. More than 1000 human beings have died in this latest siege on Gaza by the Israeli government. The bombardment of Gaza is part of a broader deliberate strategy to commit genocide. In 2002, Israel began building a 25-foot high concrete wall that meanders for hundreds of kilometres through the ‘occupied territories’ of Palestine (now absorbed into Israel).This apartheid wall cuts-off communities from trading between Palestinian farmers and anyone else in surrounding neighbourhoods. It works as a mechanism for the Israeli state to steal land so that developers can build ‘settlements’ for indoctrinated middle-class Israelis to buy.